Please Note: In Chrome, the 'Block third party cookies and site data' box must be unchecked in order to be able to add text in the question editor. If you cannot enter text, please make sure this box is not checked in your Chrome settings. A short text question is a short response type question that allows the student to enter text in response to a stimulus; usually just a few words. To add an optional passage, calculator, or a ruler, click the Add Feature button. Type the question in the Compose Question field. In the Set Correct Answers, write how many points it is worth and choose if you want exact response or containing any text. Then type the correct answer into the Value field. Click on the carat to show More Options. 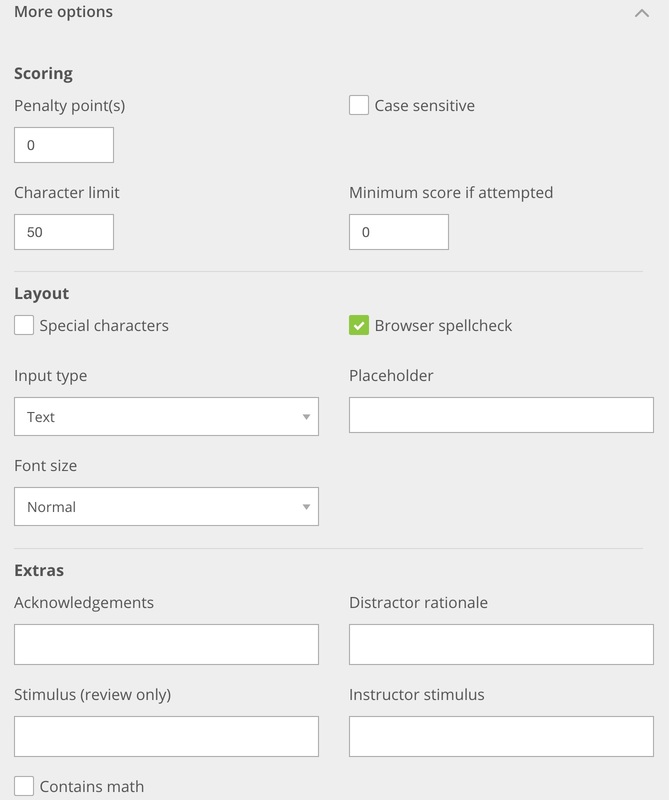 You have the option to include a character limit or check if it is Case Sensitive. You may also change the formatting of the layout. Before you publish the item, validate that the answers are functioning correctly. To do this, type the answers(s) in the preview pane and click the Show Answers box. Correct answers should be highlighted in green and incorrect answers should be highlighted in red. After you have finished creating the item, click the Publish button to share the item with any district teachers, or click the Publish and Reserve button to share the question with district administrators only.